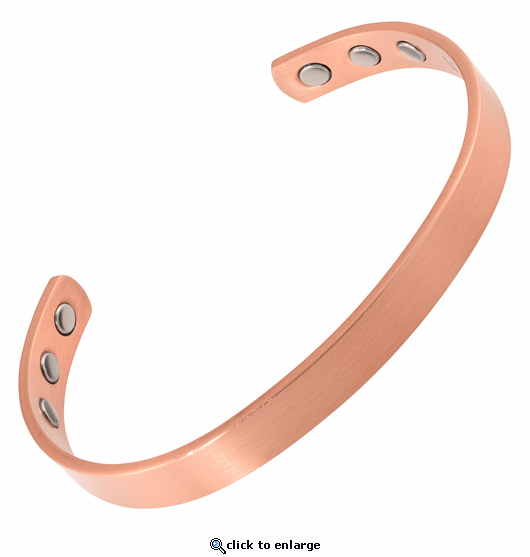 This is a brushed copper magnetic therapy bracelet. It is simple in design and has 6 powerful and permanent 3000 gauss neodymium rare earth bio north facing magnets. This bracelet is similar to our shiny copper band bracelet, but instead has a brushed or burnished look rather than shiny copper. It also has stainless steel magnet caps for added durability. Enjoy the simplicity of this design.